For feedback, contact info@roamingpenguin.com. The developers cannot reply to feedback given through the Android Market. You are traveling with a group of friends, and whenever there is a bill to pay (for e.g. taxis, restaurants, or hotels), one of you pays the full amount. At the end of the trip, all expenses are consolidated to determine what balance needs to be settled. 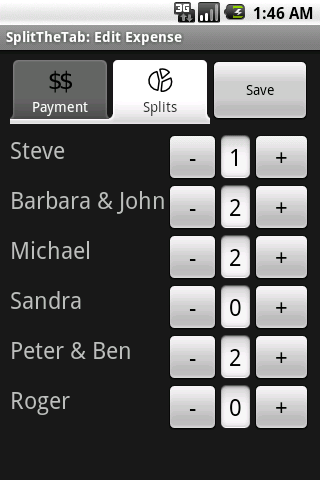 SplitTheTab makes it easy to capture every expense and to keep a running total of the balance. All expenses are split among "accounts". An account represents one or more people from the same household - in other words, they share all costs. For each expense, SplitTheTab records who paid for it (the "payer"), on who's behalf it was paid (the "payees"), and what portion of the expense is allocated to each payee (the "split"). Furthermore, each expense is associated with a currency. For reports, the amounts are multiplied with the respective currency's exchange rate. The group goes to a restaurant and Bruce pays the bill. He is the payer. He also is a payee with a split of 1, while Clark and Lois are a payee with a split of 2 and Peter is a payee with a split of 1. Bruce's account is credited with 3/4 of the bill (the amount he paid minus the amount he consumed), while Clark and Lois' account is debited with half the bill and Peter's account is debited with 1/4. For a bar bill, Bruce has a split of 0 (he doesn't drink), Clark and Lois have a split of 2 and Peter has a split of 1. For a hotel bill, all three accounts have a split of 1 - Clark and Lois share a room, hence they don't pay more than the other accounts. Press the button on the top to create a new trip, or select an existing trip. 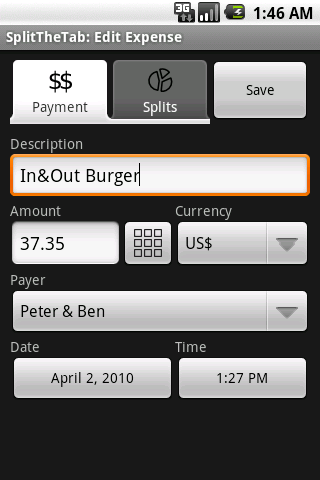 The buttons on top allow you to add new expenses, accounts, or currencies. Press on an expense to edit it, or long press to delete. 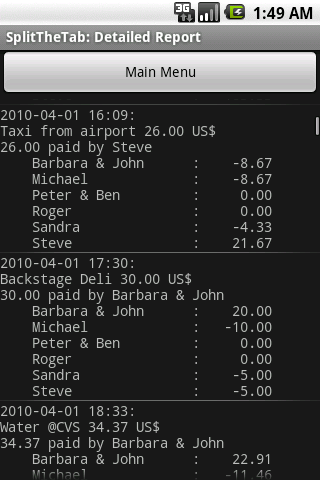 This screen also has menu entries to bring up the account and currency editors, generate reports, and export the trip data as a CSV file. 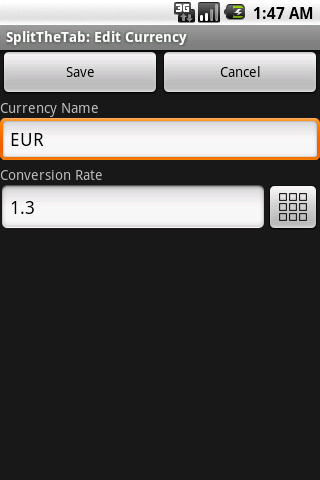 On the Payment tab, you enter most of the trip details: description, amount, payer, and date. The button with the small rectangles opens a numeric keypad for easier entry. 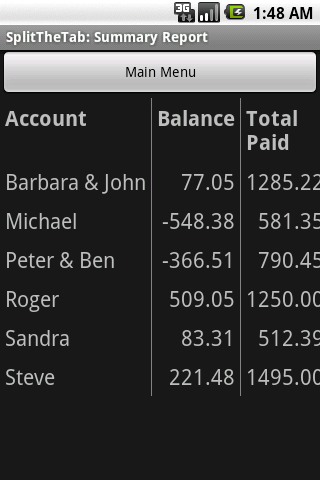 The Splits tab captures how the expense is distributed to the individual accounts. The values can be modified using the "+" and "-" buttons. Don't forget to press on Save after making your edits! For the currencies, it is recommended to use standard 3-letter codes (for example, "USD" for US dollars), and to use a conversion rate of 1.0 for your home currency. 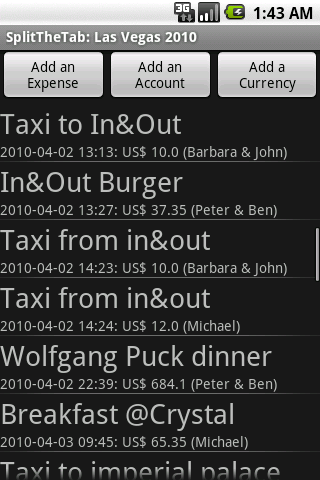 At the end of a trip, it is desirable to review the expenses among all participants, e.g. to detect typos and missing records.